There are countless knives specifically designed for the hunter available in the marketplace. These range in price from $20 to $1000 or more, depending on the construction, design and materials used. A cheaply constructed knife cannot be expected to last as long or perform as well as a knife fashioned from premium materials. When selecting a hunting knife, consider where it is going to be used and how long you intend to keep it. The money you saved on that bargain knife will be of no consolation if the blade breaks while you are caping a record-book sambar deep in some isolated gully. Most of us, me included, often abuse knives in the field, attempting tasks that are outside their design capacity. Using knives, screwdrivers or axes is tempting when they are the only tool to hand, but it often results in damage beyond repair - more importantly - damage that renders the knife unsuitable for its original purpose. My advice to anyone intending to purchase a hunting knife is to buy quality and buy the smallest knife suitable for the intended task. 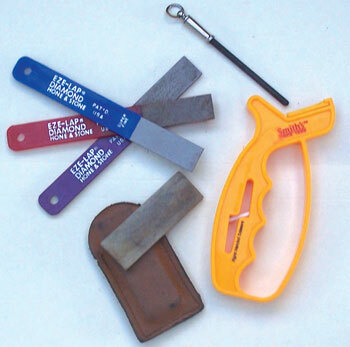 Outdoors knives come in a variety of sizes and can be subdivided into small, medium and large game and utility knives. There are two basic designs - fixed-blade and folding. Folding knives with locking blades are the safest and easiest to carry. However, they need to be well constructed or they will become sloppy and dangerous. Fixed-blade knives are stronger and essential for handling large game. However, they need to be carried in a very sturdy sheath or knife roll to ensure your safety in the event of a fall. A number of hunters have sustained severe injuries from sheathed knives piercing their body in falls. Small game - such as foxes, hares, rabbits and birds - do not require large heavy knives to dress or skin. Most can be skinned with minimal use of a small knife - to make the appropriate starting and parting cuts - with skin pulled off by hand. Most beginners make the mistake of purchasing a knife that is too large for the job. A small folder with a short blade is all that is required. Blade length need not exceed three to six centimetres. 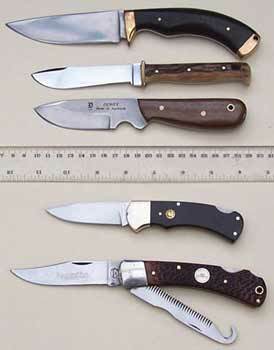 Image 2: Knives suitable for small game. Top: Winchester brass handled, drop-point folder: this small knife with a four-centimetre edge is ideal for game birds such as quail or duck. These knives were available from Winchester in the 1980s for $20 plus the tops of four packets of shotgun cartridges. Although small, it is strongly made and slim, an ideal pocket knife. Puma Hobbytec folder: a straight-point slim-bladed knife, ideal for all-round use on small game. Buck Caper fixed-blade: this knife is specifically designed for delicate caping work. It features a pointed, hollow ground blade with a thick back. I have found this blade design more useful for shucking oysters than caping. Buck folder: another drop-point example, with hollow ground blade that is solidly built. This is the knife I most often carry for caping and cleaning trout when hunting sambar. Bottom: Remington waterfowl folder: with a second, serrated edge blade, choke tool and pin punch, this was a versatile knife in the days of semi-auto shotguns. Deer and similar-sized, thin-skinned game, such as pigs and kangaroos, generally provide little resistance to the knife and skin. A medium-sized knife with a cutting edge of six to eight centimetres is all that is required to successfully skin and field dress game of this size. Beginners may find a small bone saw useful to remove the head, but with experience, it shouldn’t be difficult locating the keyhole where the spine joins the skull and severing the cartilage and ligaments with minimum force from your knife. 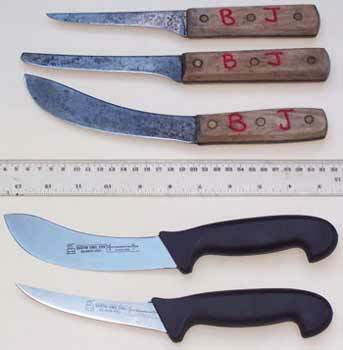 Image 3: Knives suitable for medium game. Top: Shaka fixed-blade skinner: this African, handmade, heavy-blade skinner sits well in the hand. The ten-centimetre blade is a little more than is required for deer, but I use it occasionally as it reminds me of wonderful times in Africa. Puma, fixed-blade, Hunters Pal: this is a practical fixed-blade knife for medium game. Dewey fixed-blade skinner: an excellent, no frills, heavy skinner ideal for medium game. German Puma 4 Star folder: this is one of my favourite sambar knives, an extremely strong, compact folder with a 6.5cm blade that does the job well. Bottom: Remington Big Game folder: this clip-point example is the lightest construction of the group and the least satisfactory example for hunting use. The bone saw with gutting hook looked good to me when I bought it. However, in practice it sits proud of the handle and is uncomfortable to use. Large, thick-skinned game, such as buffalo and scrub bulls, require heavier, larger knives to get the job done.Buffalo in particular do not give up their skin easily. In addition, the skin is thick and tough and generally encrusted with mud. Initial cuts through the skin can be made with a disposable-blade Stanley knife, to save blunting your skinning knife before the real work starts.However, your knife will still lose its edge in the skinning and caping process. While back skins can be removed readily, the head requires physically cutting the skin away from the skull. For this reason I favour softer steel knives that can be readily sharpened in the field. A large skinner with a 12 to 15cm cutting edge and a filleting or boning knife for the more intricate work are required. 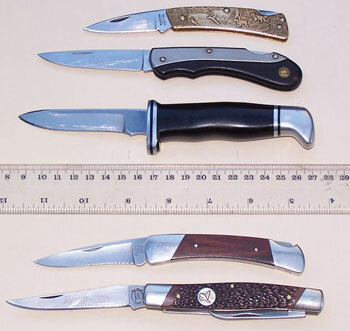 Image 4: Knives suitable for large game. Top: Green River filleting/boning knife: this knife is primarily used for caping buffalo, pigs and bulls - where the sharp point is often essential. A larger Green River filleting knife with damaged point from user abuse: this knife is still useful as a back-up skinner and boning knife. (These two knives and the Gustav Emil Ern boning knife can be put to good use filleting barramundi). Green River skinner: a good no-nonsense skinner for large game where every centimetre of skin has to be worked from the animal. Green River knives are made of softer carbon steel and they accept an edge more readily than most hunting knives. Bottom: Gustav Emil Ern skinner and boning knife: these knives are made with German stainless steel. Industrial-grade, no-nonsense knives and a suitable steel or sharpener are the most practical means of getting the job done. The key to a sharp knife is the maintenance of a uniform and regular angle on the edge of the blade. There are some skilled individuals who can maintain a constant angle and effectively sharpen their knives with just the use of an oilstone; I am not one of them. I am not alone in this regard and there have been a number of proprietary tools developed to speed and assist this process. I use the American-made Smiths Sharpener. It’s quick and it can be readily carried in the field. There are cheaper copies available, but they generally don’t last long and their cutting tools are not firmly fixed, so variation to the cutting edge results. The drawback with the Smiths tool is it can only provide one angle on the cutting edge. Other, more complex tools, can allow you several options - with very acute angles available for thin, sharp knives designed for light work, and broader angles for large knives required to do heavy work. In this regard they are more versatile, albeit more cumbersome to use. For use in the field there are a number of options, including oilstones, mini steels and diamond stones. I highly recommend all hunters carry a sharpening tool. Maintaining a sharp blade means your cuts can be executed with the minimum of force. This makes for precise and safe work. Excessive force on a blunt blade is the most common cause of self-inflicted knife wounds and damage to capes. A wipe with an oily rag after cleaning and sharpening will protect your blade from rust and corrosion, including stainless steel knives, which although highly rust resistant, will still discolour and rust if neglected.